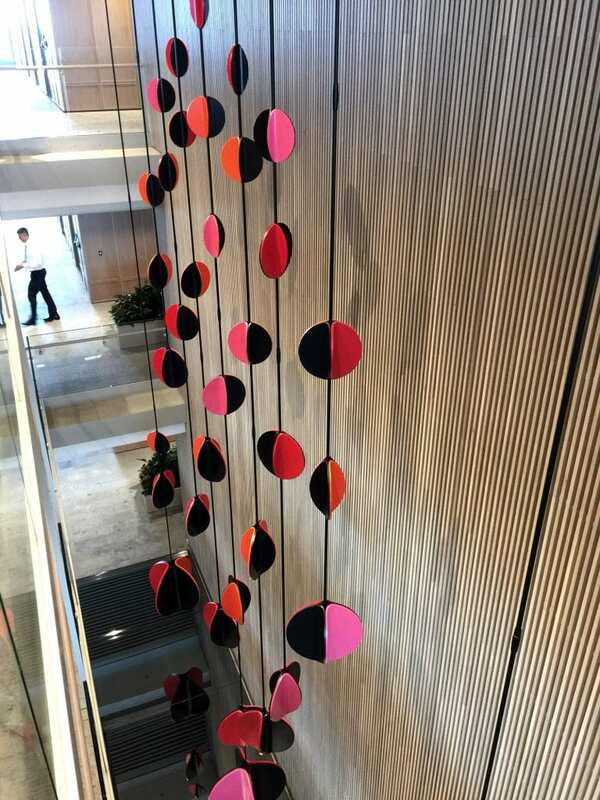 Marion Borgelt’s milestone sculptural installation ‘Cascadence’ (2018) hangs through a three-storey void in the Baker McKenzie offices at One International Towers, Barangaroo. On Sunday 4 November, Sydney Open will unlock the doors of more than 40 of the city’s most important, inspiring and intriguing buildings and spaces, giving the public a chance view Marion’s stunning kinetic work. This installation takes form as a cascading network of orbs and a cadence of rotating colour. The droplet is captured the moment before it falls into the void, suspending time itself. The installation references the gravitational forces acting upon the droplet, and ideas of weight and balance which have long been elements of artistic representations of justice. Opening hours: 10am – 4pm on the Ground Floor lobby and Baker McKenzie offices on levels 44, 45 & 46 at 100 Barangaroo Avenue, Barangaroo (Entry via South Lobby / North Lobby entrance via Watermans Quay).